"A cake that makes your whole house smell good." Preheat oven to 300 degrees F (150 degrees C). Grease a 9x13 inch pan. Mix together the flour, cinnamon, cloves, nutmeg, 1 teaspoon baking soda, baking powder and salt. Set aside. In a large bowl, cream together 1 cup butter and 1 1/2 cup sugar until light and fluffy. Stir in the eggs. Beat in the flour mixture alternately with the buttermilk, mixing just until incorporated. Fold in the chopped figs and pecans. Pour batter into prepared pan. Bake in the preheated oven for 60 minutes, or until a toothpick inserted into the center of the cake comes out clean. Allow to cool. To make the icing: In a large saucepan, mix together butter, sugar, evaporated milk and baking soda. Bring to a boil, stirring until sugar is dissolved. Then cook without stirring until the mixture turns brown, or until it reaches the soft ball stage on a candy thermometer (234 degrees F - 115 degrees C). Cool to lukewarm (110 degrees F). Pour into a small bowl and beat until it thickens to spreading consistency. Quickly spread icing onto the cooled cake. This cake is WONDERFUL! Very moist and flavorful. I used a cream cheese frosting instead of the frosting in the recipe. 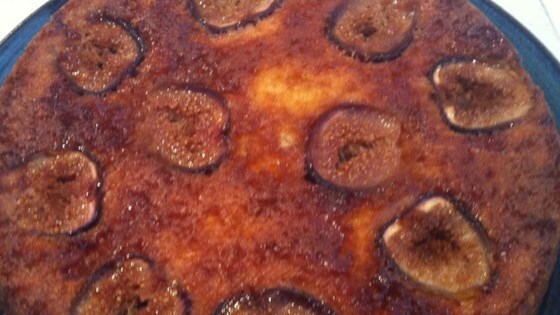 I know I will be making this every year my fig tree produces! Really tasty, and a great way to use up my fresh figs. It freezes very well also!